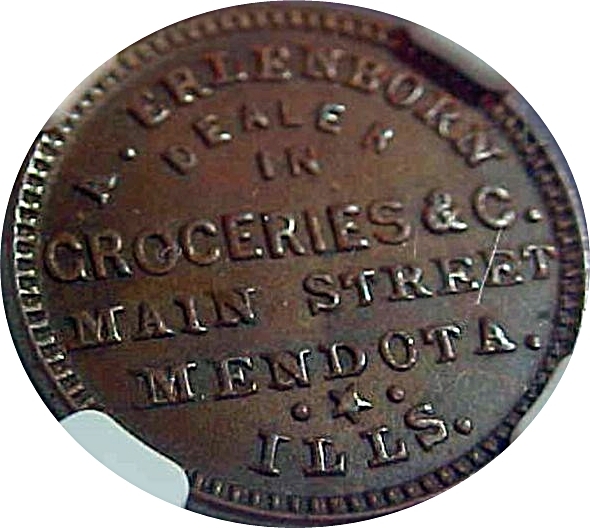 This Civil War Store Card of Mendota, Illinois is ascribed to the shop of S.D. Childs. This token is the only issue known for this city. Childs was a prolific token manufacturer. His dies commonly make use of a woman’s head and most of his dies use sans-serif lettering. He also produced Sutler tokens. A. Erlenborn / Dealer / In / Groceries & C. / Main Street / Mendota. / Ills.